Green Star teaching artists lead participants through each phase of the mural project: Design, Preparation, and Installation. Through group discussions, participants decide on themes for the mural that are meaningful to them, like hope, justice, or diversity. Next, they learn artistic techniques such as tile shaping that will be essential to completing the project. Finally, participants apply what they’ve learned and work together to install the mural. Upon completion, the community celebrates with a mural-unveiling ceremony. By involving youth and community members in the design and installation of public art, Green Star Movement goes beyond inspiring passion for the arts by giving participants and their communities ownership over the art. We teach the fundamentals of mosaic, sculpture, painting, and photography. Our process is advantageous for three distinct reasons. It is an art form that is accessible for artist of all ages and abilities, meaning that participants can experience “success”as an artist relatively quickly. it is durable and resistant to vandalization, making it a good choice for public art. And finally, the mix of texture, shapes, materials and colors produces a feast for the eyes. Students who were exposed to an abundance of art-related experiences are more likely to attend college despite the fact that 71% of the 18,000 participants were from low socioeconomic backgrounds. All the arts disciplines, such as music, dance, and theater, have been shown to enhance student cognition and attention. All of these influences of the arts, in turn, resulted in increases of student academic performance and general wellbeing. Integration of arts with other subjects is considered one of the most effective tools for increasing student retention of content. Because arts integrate so effortlessly with other subjects and foster meaningful connections with various disciplines, knowledge-bases, and skills through solving real-world problems that address important questions, arts integration becomes a key element of holistic education. Science and math lessons are often less interesting to students because the lessons lose the real-world applicability once they become more quantitative. This situation can be mitigated through the use of arts integration. Art can help rekindle the interest in STEM disciplines of students who are more art-oriented by providing occasions to connect learning with self-expressive pleasure and by providing opportunities for all students to feel successful. Using the motivational power of the arts can help students stay engaged during STEM lessons and reveal the connections between the content and the real world in addition to making the math and science lessons less threatening, and, therefore, more enjoyable. In 2015, we completed three large-scale murals in Rio de Janiero, Brazil, as part of our two way artistic exchange initiative. By educating and inspiring youth through these inclusive public art projects and providing them the opportunity to explore new cultures, GSM hopes to empower the next generation of artists to ignite positive change in their communities. In 2018, three of our Teaching Artists and two of our teen apprentices headed to Negril, Jamaica for an exchange with Jamaican artists, youth, and residents, resulting in multiple collaborative mural projects. In addition to beautifying a public space in the city, we will be partnering with the Rockhouse Foundation to work with the students and faculty of Savanna La Mar, a new school, and the first of its kind in that part of the country, to serve youth with special needs. WANT TO CHANGE YOUR URBAN CANVAS WITH Green Star Movement? Fantastic! 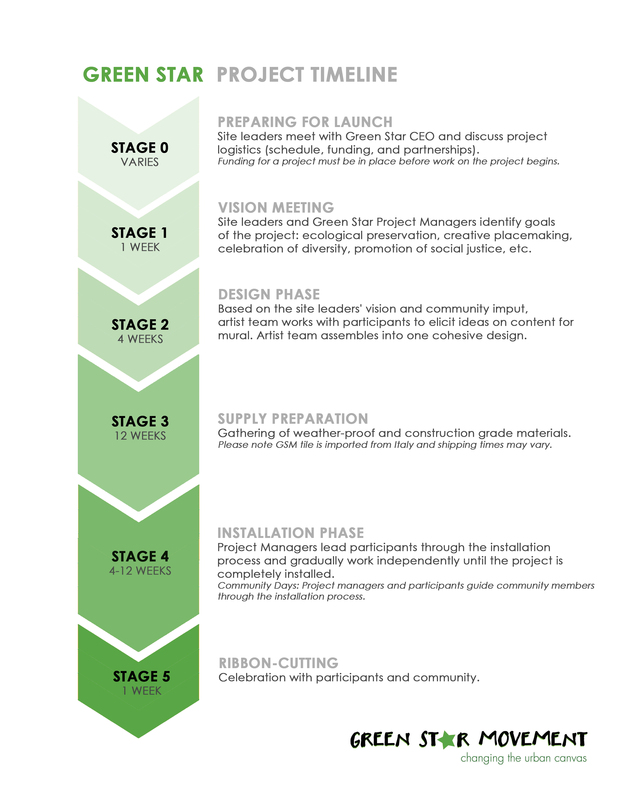 See documents below for more information about our Program and Process and then contact us at program@greenstarmovement.org and let us know a little about what you have in mind. Answers to the following questions will help us put together a proposal for you! 1. Is this program for a school or community at large? If the program is for a community at large, did you have any local groups who would be interested in participating, such as neighborhood associations or youth programs? 2. Do you have a wall in mind for the mural? What are the dimensions of the wall? Is it indoor or outdoor? Can you provide a picture of the wall? 3. What type of budget do you have in mind for the program? Do you have any resources or funding already in place? 4. Do you have a timeline in mind for when you'd want the program to take place?